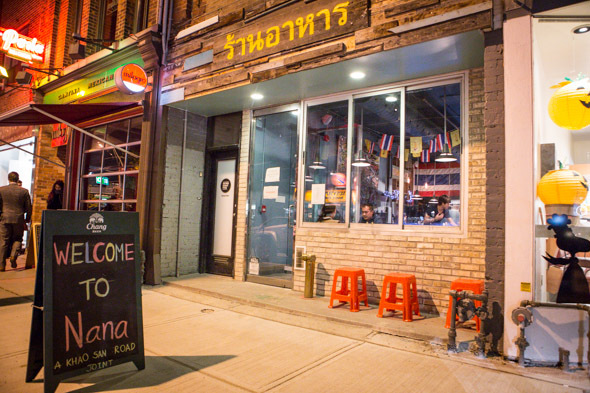 Nana is finally open on Queen after more than a year of teasing to its potential, with papered windows advertising absurd concepts like New Delhi Burgers , Sammy's Sammies , and Cakehole - complete with opening menus and worked up branding. Someone was clearly putting a lot of effort into this. As a writer tasked with a weekly column devoted to Toronto restaurant openings, I was first just excited to have something to write about. When it became apparent that the whole thing was a calculated farce, part of me thought it was funny, while the other part was just sad that Toronto was not in fact getting its first ramen burger or a bacon weave sandwich. As it turns out, the man behind it all was Monte Wan of Khao San Road and the new restaurant carries on in the style he knows best. The Thai spot aims to evoke Bangkok's Entertainment District: Cobblestone floors and shuttered walls give the space an outdoor feel while plastic stools and metal tables give it a street party vibe. I don't want to like this place, but the southern fried chicken laab ($12) wins me over instantly. 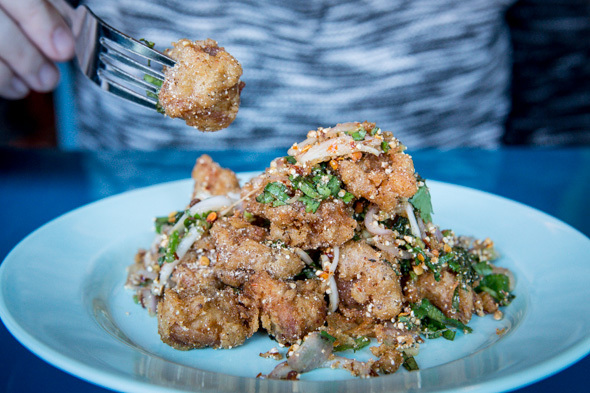 Super crispy morsels of golden fried chicken are aggressively seasoned and dusted in powdered, toasted rice. It's finished with sharp, sweet shallots, mint and chilies, all contributing to a sweet, sour, salty trifecta of flavours. From the list of mains there's khao soi with crispy fried chicken ($15), distinguished from the one at KSR1 with a thinner, coconut-scented broth. Fried chicken is fun, but demands immediate attention to enjoy it at its crispest. Fresh sprouts, fried shallots and crunchy rice noodles give the dish a great variety of textures. 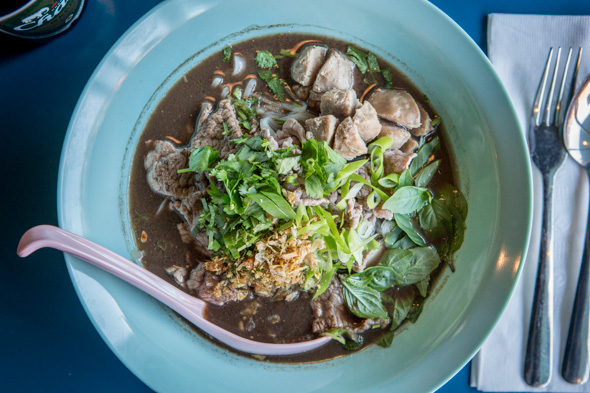 The rich, deeply coloured boat noodle soup ($15) is thickened with beef blood and spiced with star anise and cinnamon. The hearty bowl is full of vermicelli and torn brisket plus meatballs and tender slices of beef. 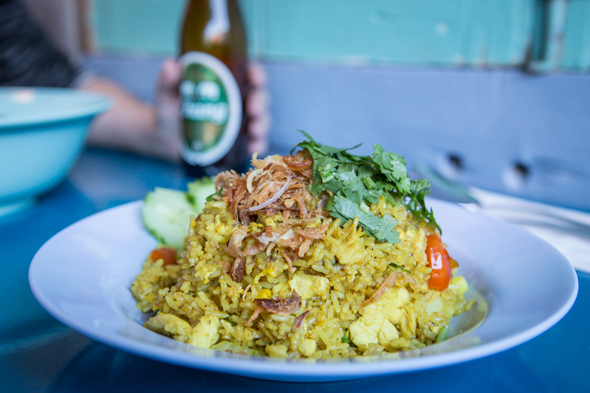 Yellow curry Thai-style fried rice ($15) with chicken (or a choice of any protein) is flavoured subtly with coconut and topped with crispy fried shallots. It's portioned like a side dish, and I'm not sure it warrants the price tag. Surprisingly, for a place that's been in the works for over a year, the bar program isn't thought through yet. 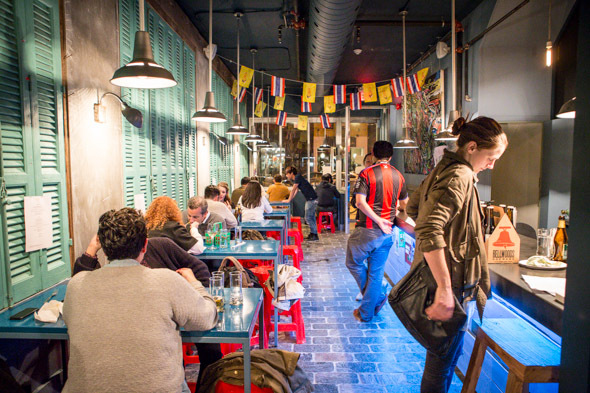 Chang in bottles sells for $6 while four taps are still awaiting final selections. Wines are limited to just one house red and one white for $10 per 5oz pour. BevLab , known for drinks topped off with flavoured clouds, has been tasked with creating a cocktail list, but at a week old, the restaurant is operating without anything enticing to go with that fried chicken. 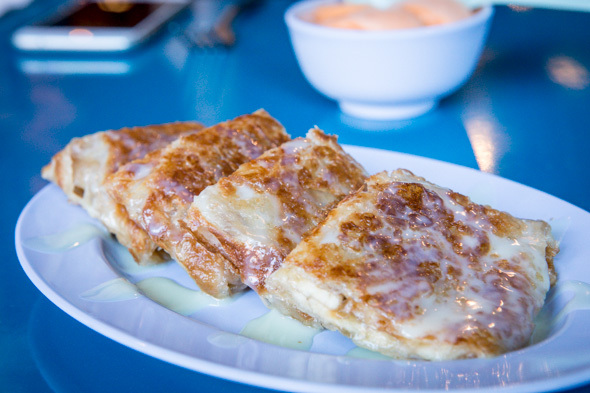 Desserts like banana roti ($8) fried in butter and finished with condensed milk are worthwhile. So are the rare and interesting custom gelato flavours, like Thai black tea, commissioned from Millie Creperie . I don't care that the name is officially Nana; I told Wan I'm going to forever refer to it as KSR2. He didn't like that, so now I really hope it sticks.